What’s tougher than deciding how to make your bloody mary or garnish it? What food to pair with it, that’s what. Like most cocktails, the food that goes with them can be just as important as how they taste. We’ve all tried our favorite drinks with some of our favorite foods and the flavors just don’t mesh. It’s important to keep the flavors consistent with what is in your drink, as your taste buds will react poorly otherwise. So, we did the work for you (you are very welcome) and put together our list of the best food to pair with a bloody mary. Step 1 is obvious…make the best bloody mary. If you have the perfect bloody mary mix, you’re 90% there. Want a bloody mary bar? Get the bloody mary kit. If anyone questions you when you order mozzarella sticks before noon, remind them that mozzarella cheese is a classic pair with tomatoes, herbs and spicy meats — flavors that can all be found in a good bloody mary mix. Then take a big swig of your bloody and dare them to question you again. Cut the cheese into 8 3 1/2/x 1/2×1/2″ sticks. Put flour into shallow dish and dredge the mozzarella sticks lightly in flour, shaking off the excess. One by one, dip in the beaten egg, coating completely, and then roll in breadcrumbs to coat. Put the sticks on a plate and freeze for 15 minutes. Heat a deep fryer or heavy pot to 365 in 3 inches of oil. Fry the mozzarella sticks in 2 batches until golden brown, about 1 minute. Drain on paper towels and serve with hot marinara sauce. Whisk the eggs and milk in a shallow dish or pie plate. Mix the breadcrumbs, parsley, rosemary and 1/2 teaspoon each salt and pepper in another shallow dish. Dip the ravioli in the egg mixture, letting the excess drip off, then coat with the breadcrumb mixture. Return to the baking sheet and freeze until hard, about 15 minutes. Heat about 1 inch vegetable oil in a deep skillet until a deep-fry thermometer registers 350 degrees F. Fry the ravioli in 2 or 3 batches, turning as needed, until golden brown, 4 to 6 minutes per batch. Transfer to a paper towel-lined baking sheet to drain and immediately sprinkle with the parmesan. Serve with the marinara sauce. Place pita triangles on a large baking sheet and spray the surface with cooking spray. Season the tops with garlic salt. Bake 6 to 8 minutes, until golden brown and crisp. Meanwhile, rinse and drain 1 can of the chickpeas. Place drained chickpeas in a blender and add red peppers, tahini, lemon juice, garlic, and cumin. Process until smooth. Season, to taste, with salt and black pepper. Transfer to a serving bowl and top with parsley. You think you’re fancy, huh? We like that 🙂 fancy can be fun. One of my favorites out of this list of best foods to pair with a bloody mary is the bacon wrapped scallops in this section. Your taste buds will be mind blown. Melt 1 tablespoon butter. Place 1 phyllo sheet on a clean surface (cover the other sheets with a damp towel), brush with melted butter and sprinkle with 1 teaspoon parmesan. Cover with another phyllo sheet, brush with more butter and sprinkle with another teaspoon parmesan. Top with the remaining phyllo sheet and brush with butter. Cut the phyllo stack into 24 squares, about 3 inches each. Brush a 24-cup mini muffin tin with oil, then firmly press a phyllo square, buttered-side down, into each cup. Bake until golden, 10 minutes. Meanwhile, heat the remaining 3 tablespoons butter in a saucepan over medium heat. Add the shallot and garlic and cook until translucent. Stir in the flour, then add the milk and stir until the mixture is smooth, 1 minute. Add the nutmeg, 1/2 teaspoon salt, and pepper to taste. Stir in the goat cheese, lemon zest and vinegar until the cheese melts. Remove from the heat and mix in the egg yolks, then the spinach. Beat the egg whites to stiff peaks and fold into the spinach filling. Spoon about 1 tablespoon filling into each phyllo cup and top with the remaining parmesan. Bake until the filling is set, 15 minutes. Cool slightly in the pan; remove and top with the chives. Preheat oven to 425 degrees. Preheat grill to medium-high heat. Rinse scallops under cold water and pat dry. If necessary, remove the scallop “foot” from the side of the scallop and discard. Place 6 skewers in a shallow baking dish. Cover with water and a splash of white vinegar. Set aside. Lay bacon on a foil-lined baking sheet in a single layer. Bake until brown but still pliable, about 10–15 minutes. Remove from oven and let cool slightly. Rub mustard all over the scallops. Wrap each scallop with one piece of bacon with the browned side facing in. Thread two bacon-wrapped scallops on each skewer through the bacon to hold it in place. Oil the grill with some canola oil, and place the scallops on the hot grill, and cook on all sides until the bacon is crispy and scallops are barely cooked through (about 5-10 minutes). Preheat oven to 375 degrees and bring a large pot of salted water to a boil. Cook pasta to al dente and drain. In a large pan, cook sausage, crumbling it with a wooden spoon as it cooks. Once no longer pink, remove it to a bowl with a slotted spoon and set aside. Add onion, red pepper, and jalapeno to grease in pan and cook until softened, about 4 to 5 minutes. Spoon onion mixture into bowl with sausage. Add the butter to the pan and melt over medium heat. Whisk in flour and cook for 2 minutes, stirring constantly. Gradually whisk in milk. Bring to a boil and simmer for 2 to 3 minutes, until thickened. Turn heat off and add ⅔ of the cheese. Stir until melted. Season to taste with salt and pepper. Add pasta, and reserved sausage/onion mixture. Stir until evenly mixed. Pour into a buttered casserole dish or cast iron pan. Add the onion and red pepper* to the saute pan, and saute for 5 minutes until cooked. Add the garlic and saute for an additional 2 minutes until fragrant. (If using the jarred roasted red peppers, wait to stir them until after the garlic.) Pour the vegetable mixture into the mixing bowl with the sausage. Add the hash browns and 1 1/2 cups cheese to the mixing bowl with the sausage and veggies. Stir to combine. In a separate bowl, whisk together the eggs, milk and black pepper until combined. Then add them to the hashbrown mixture, and stir to combine. Pour the mixture into a 11×7-inch or a 9×9-inch baking dish (a 9×13-inch dish will also work), and top with the remaining 1/2 cup of shredded cheese. Cover with aluminum foil and bake for 20 minutes. Then remove the aluminum foil and bake for an additional 10-15 minutes and the top of the potatoes begin to slightly brown. Remove and let the casserole rest for 5 minutes. Sprinkle with green onions and serve! Form sausage into 4 patties. Cook in a large, non-stick sprayed skillet over medium-high heat for 3-4 minutes a side, or until golden brown and crisp. Place sausage patties on a paper towel-lined plate to drain the grease. Drain fat from skillet then return to stove and turn heat down to medium. Whisk eggs, salt, and pepper in a bowl then pour into the skillet. Cook until top is nearly set but still glossy, then carefully fold eggs over in half. Remove from heat to finish cooking. In a small bowl, whisk butter until creamy and smooth. Stir in the maple syrup. Toast the English Muffins. To assemble: Spread 1 tablespoon of maple butter on English Muffin, both halves. Place 1 egg on the bottom of a English muffin then top with cooked sausage patty and slice of cheese. Microwave for 20-30 seconds to melt cheese then cap with English muffin top. Continue making other sandwiches. Serve immediately. In a shallow bowl whisk the eggs, milk, cinnamon and vanilla together. You need these snacks if you are having guests over. You definitely can’t forget about snacks when thinking about the best food to pair with a bloody mary! Heat bacon fat and butter in a small saucepan over low (you only live once, after all) just until butter is melted and combined. Remove from heat and stir in paprika, lime zest, and 1 tsp. salt. Let sit, stirring occasionally, until mixture is the consistency of heavy cream (you can place the saucepan in a bowl of ice water and stir to help speed things up if you’re impatient), about 30 minutes. Dip radishes one at a time into butter, letting excess drip off; if butter starts to set, very gently rewarm over low heat. Transfer radishes to a serving platter and sprinkle with more salt; reserve any leftover butter for another use. Heat broiler. Okay, now you’re going to cut out the interior of the bread and remove it as one big rectangle of carby goodness without messing up the outside crust. It helps to check the step-by-step photos for this, but trust us, it’s easier than you think! Using a bread knife, cut horizontally along top of loaf just below where it starts to dome (if your loaf has a flat top, cut across to remove any crust); set top aside and position bread so cut side is facing up (in other words, you’re looking down at the surface of the exposed inner loaf). Working around perimeter of loaf, cut down parallel to sides and about ¼” from edge; try not to cut all the way through or your toasties will fall through the bottom (sad!). Once you’ve gone all the way around, switch to a knife with a pointed tip (either a slicer or a chef’s knife). Insert blade perpendicularly into longer side of loaf about ¼” in from side and ¼” from bottom, but do not push through to crust on opposite side. Slice through bread, cutting parallel to work surface, until you get to the middle of the loaf, then stop. Rotate bread 180° and repeat on opposite side, only cutting to midpoint again. You should be able to lift out the rectangle of bread at this point (if not, retrace all cuts until bread comes loose). Cut rectangle of bread filling into ¼”-thick slices. Brush 1 side of slices with melted butter. Transfer buttered side up to a rimmed baking sheet. Broil slices until golden brown and toasted, about 2 minutes; let cool. Preheat oven to 400°. Smear untoasted side of half (not all!) of bread slices with mustard, then top with ham and cheese, dividing evenly. Close with remaining bread, toasted side up. Cut each sandwich in half on a diagonal, then tuck sandwiches back into hollowed-out loaf, lining them upright and packing in tightly (you may have an extra sandwich that doesn’t fit, so go ahead and eat it). The tops of the sandwiches should be flush with the top of the loaf…amazing, right? Place dome back on top of bread and wrap loosely in foil (poke the top of foil with your knife for steam to escape). Place loaf directly on oven rack and bake until cheese is melted, 25–30 minutes. Remove foil and let loaf stand uncovered for a few minutes to cool, then serve. Cut potatoes in half and scoop flesh into a medium bowl; discard skins. Mash, then mix in scallions, breadcrumbs, cream, sour cream, butter, granulated garlic, pepper, 2 tsp. salt, and 2 Tbsp. Parmesan. Mix in eggs just until combined. Roll 1-tablespoon portions of potato mixture into balls. Pour oil into a medium skillet to a depth of ½” and heat over medium heat until bubbles form immediately when a little potato mixture is added. Working in batches, fry tots until deep golden brown, about 3 minutes per side. Drain on paper towels; season with salt. Serve with spicy mayonnaise. I mean, just this name is cute enough. Yes- I just said cute. Cutely delicious. Preheat oven to 250°. Mix jam, red pepper flakes, and vinegar in a small bowl; season with salt. Set half of spicy fig jam aside. Spread 6 slices of bread with remaining spicy fig jam and top with cheddar and remaining 6 slices of bread. Spread outside of sandwiches with butter. Heat a large skillet over medium heat. Working in 2 batches, cook sandwiches, pressing down firmly, until golden brown and cheese is melted, about 1 minute per side. Transfer to a wire rack set inside a baking sheet and keep warm in oven until ready to serve. Cut each sandwich into 4 triangles and serve with reserved spicy fig jam for dipping. Like your bloody mary to have a little more spice? Try using our Spicy Bloody Mary Mix! For spicy bloody mary food pairings, or if you’re making Bloody Marias…make these dishes. The bloody maria opens the door to put a Mexican spin on your “bloody” experience. So the food pairings you choose can represent that accordingly! These are a latino classic and a downright tasty treat if you like a little crunch with some punch. Pop these onto a stick and add them to your loaded bloody maria. In a medium saute pan, heat olive oil over medium heat. Add garlic, onion, and poblano pepper and saute for 4-5 minutes, until fragrant and slightly softened. Add corn kernels and continue to cook for 3 minutes. Season to taste with salt and pepper. Remove mixture from heat into a large bowl. Add shredded chicken, salsa, and cheese and mix gently to combine. Season again with salt and pepper to taste, if needed. Spoon a small amount of filling into the center of each tortilla. 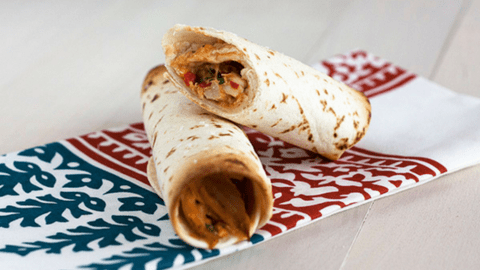 Fold edges towards each other then roll up to make a burrito shape. Place chimichangas on a baking sheet, seam side down. Meanwhile, heat vegetable oil in a Dutch oven to 375 degrees (measure temperature with a fry thermometer). 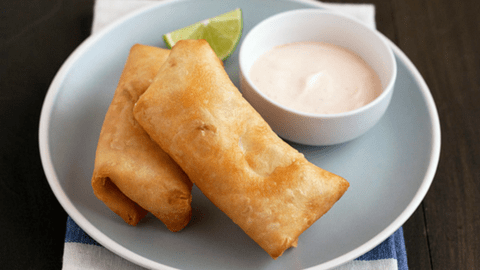 Holding chimichanga together with a pair of heat-safe tongs, carefully place and hold together in the oil for 2 minutes. Gently release the chimichanga and continue to fry for 3-5 minutes more, or until golden brown. Drain on a paper towel-lined plate. Repeat with remaining chimichangas. You’ve probably had those bland, freezer taquitos or maybe even the questionable ones from a gas station. Trust, these are a whole new ball game. In a large mixing bowl combine cream cheese, salsa, lime juice, chili powder, cumin, onion powder, garlic, cilantro, roasted red pepper, green onion, chicken, and shredded cheese. Mix thoroughly until well combined. Briefly heat the tortillas in the microwave to make them soft and pliable, about 20-30 seconds. Place a tortilla on a work surface. Spoon 2-3 tablespoons filling down the middle. Roll the tortilla up tightly around the filling. Place seam side down on baking sheet. Repeat with remaining tortillas. Spray with tops lightly with cooking spray and sprinkle with salt. 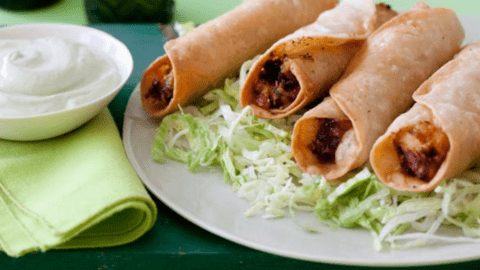 At this point you can freeze the uncooked taquitos by chilling the entire baking sheet in the freezer until taquitos are solid, about 30 minutes. Transfer to an airtight container and store in freezer for up to 2 months. Bake 15-20 minutes (a few minutes longer if frozen), until crisp and golden around the edges. While these aren’t necessarily going to work on a stick coming out of your bloody maria, you certainly won’t regret having them as a meal alongside your bloody. Pour vegetable oil into a large skillet to a depth of 1/4-inch; heat over medium-high heat until shimmering. Working in batches, submerge tortillas and fry, turning once, until just softened, about 30 to 45 seconds (no longer, you do not want them crispy). Transfer to a paper-towel-lined plate to drain. Spoon 1/4 cup of filling down the center of each tortilla and roll to enclose. 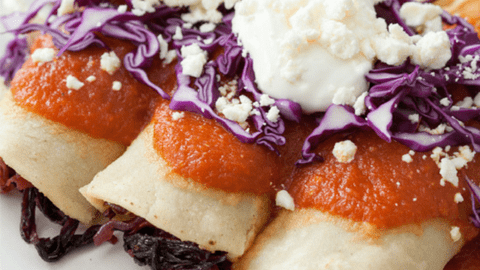 Spoon chipotle sauce over top and garnish with sour cream, cabbage and cheese. These bowl shaped hot treats will stack perfectly on a stick, making them a delicious addition to your bloody maria. Prepare grill to medium-high heat. Combine first 7 ingredients in a bowl, stirring well. Spoon cheese mixture into each pepper half. Place pepper halves, cheese side up, on grill rack coated with cooking spray. 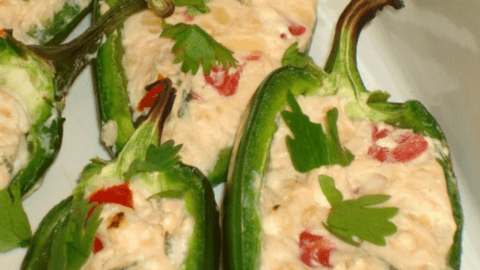 Grill peppers 5 minutes or until bottoms of peppers are charred and cheese mixture is lightly browned. Carefully pick up peppers with small tongs and place on serving platter. Sprinkle with cilantro. For our final bloody maria food pairing, a delicious latin favorite. The crunchy shell on this treat makes it perfect for adding to your loaded bloody, but with all these other choice favorites will you even have room? Yes. There is always room. Fill a large pot with enough oil to reach 2 inches up the side of the pan. Heat over medium heat until a deep-frying thermometer inserted in the oil reads 375 degrees F. To make the flautas: In a pan over medium heat melt butter and saute onions and jalapenos until tender, about 5 minutes. Add garlic, cumin, and cayenne pepper and cook until fragrant, another 2 minutes. Add chicken and salsa; stir to combine. Remove from heat and stir in cilantro, cheese and lime juice. Let cool slightly. Working with 4 tortillas at a time, spread a heaping spoonful along the middle of each tortilla. Roll tortilla tightly around the filling and secure with a toothpick. Using tongs, hold each flauta in hot oil until firm, then release to continue cooking. Cook until golden brown, about 2 minutes, then remove to a paper towel-lined plate and immediately season with salt. Keep flautas warm in the oven on a sheet tray while assembling and cooking the remaining tortillas. Each recipe here are some of the best foods to pair with a bloody mary. Some take longer than others, but if done right, these will be gone in a second. Each one pairs well with the flavors and tastes of a bloody mary. If there are alterations you can think of, try them out! These are a baseline for you to express yourself and impress your guests even more! Inspire yourself and others to take the game to the next level, we know you’re capable.